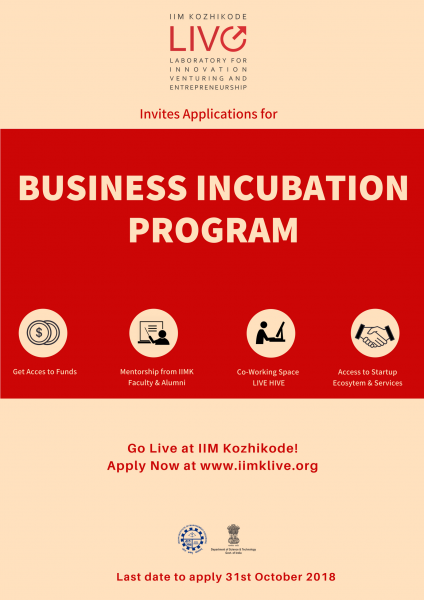 IIMK LIVE,Business Incubator and Entrepreneurship Development Centre of IIM Kozhikode is conducting the Pre Pitching awareness session on Indian Oil's Start-Up Scheme. This session is open for Professionals from Industry,Startups, Academia, as well as alumni/student of colleges/institutes/universities. 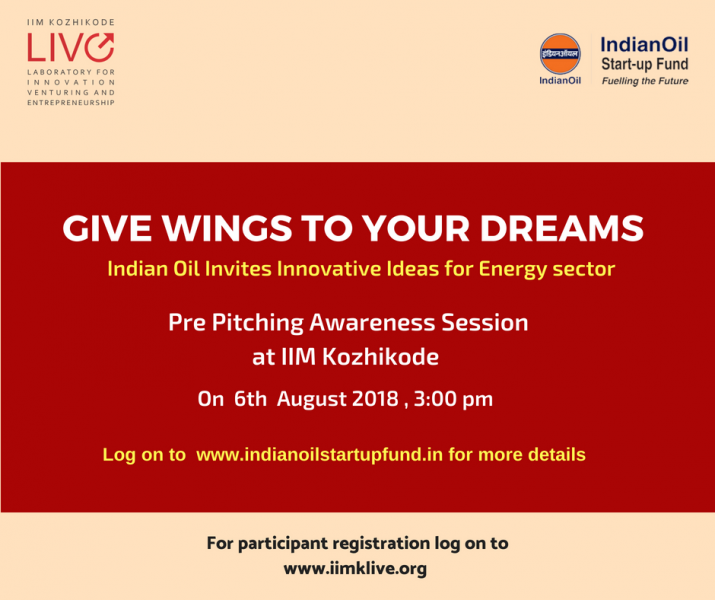 To reach out to budding entrepreneurs and innovation enthusiasts, IIMK LIVE in association with Indian Oil Corporation Ltd. is organizing "Pre Pitching Awareness Session" at IIM Kozhikode. Indian Oil officials will be conducting interactive-session with the interested people from the region and share inputs on the proposed scheme and the support provided under the Scheme. We are glad to announce the elections of new members of the Executive Committee of IIMK Alumni Association for the year 2017-18. • Announcing elections and calling for nominations on 13th Feb 2018. • Closing date for receipt of Nominations on Kasebook (Online Alumni Portal of IIM K) shall be till 15th Feb 2018, midnight. • The withdrawals from Nomination will be allowed till midnight, 15th Feb 2018 and closing Midnight on 15th Feb 2018. • The Election process will be during 19th Feb – 28th Feb 2018, online through Kasebook. The Executive Committee of IIMK Alumni Association consists of 7 elected members and 3 Ex-Officio members from the institute, namely, the Director of the Institute, Accounts officer of the Institute and the Chairperson-Alumni Relations & Activities Committee. The office bearers, namely, President, Vice President, Secretary, and Treasurer shall be elected by the Executive Committee from among themselves. The term of the Executive Committee shall be for 2 years. At present, there are SEVEN Executive Committee vacancies for two year term to be filled up by election process. The seven candidates obtaining the highest number of votes will be eligible for regular vacancies. a. Nomination Form for election to the Executive Committee is required to be proposed by alumnus along with a brief Profile (not more than 200 words) and a Photograph. Completed nomination form must be received on Kasebook latest by 12 AM on 15th February 2018.
b. Nominations will be examined by the Institute and a list of valid nominations received will be updated on Kasebook post 15th February, 2018.
c. Elections will be held Online through Kasebook during 19th February to 28th February 2018 by secret ballot. There is no provision of proxy voting. 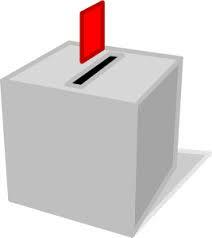 d. A tally of votes polled by each candidate will be prepared. From this tally the vacancies will be filled up based on candidates having highest votes. e. In case of a tie, the Alumni Chairperson may choose an appropriate method for resolving it. 1. This notice is prepared keeping in view the rules and regulations of IIMK Alumni Association as mentioned in its By-laws. 2. If there is a discrepancy, the interpretation as suggested by the returning officer appointed by the Institute shall be final. Greeting from the Chairman of the Executive Post Graduate Programme of IIMK. I would like to thank you all for your association with IIMK and you are the true brand ambassadors of the institute. Hope your learning with IIMK has made you a better leader and carved a niche for yourself in your work life. 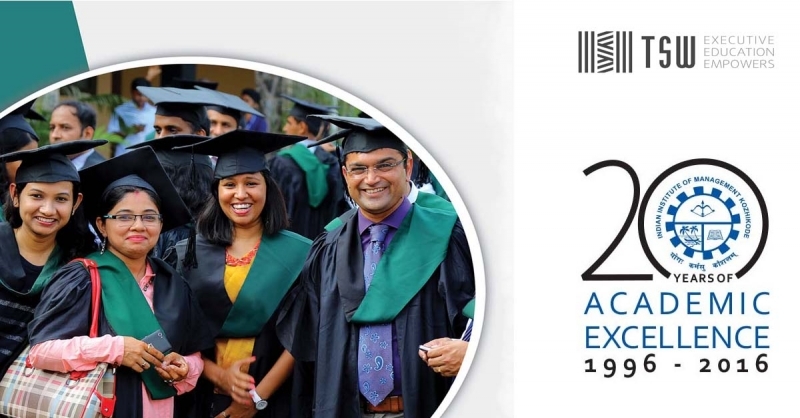 Recently we have launched the admission notification to the 9th batch of Two years Executive Post Graduate Programme in Management by IIMK and last date to apply for the programme is 30th November 2016. Below is the link for your reference. I take this opportunity to introduce our new technology partner M/s Times Center for Learning Ltd (Times Group). M/s Times Center for Learning Ltd has come up with dedicated brand name ‘TSW’ that focuses on making world-class education accessible to aspiring business leaders through strategic collaborations. Participants can opt one of the learning center from the 63 centers available across India to attend the live interactive learning sessions. I solicit your cooperation in spreading the news and driving the process in your respective organization as well as among your colleagues. If you feel worthy, please share the contact details of the head HR/ Head - training (L&D) and/or the contact details of the colleagues whom do you perceive as the prospective candidates and can be contacted for the IIMK programme by filling in the below provided link. We can also organize staff/faculty visit to your organization to address the executives in consultation with your HR. 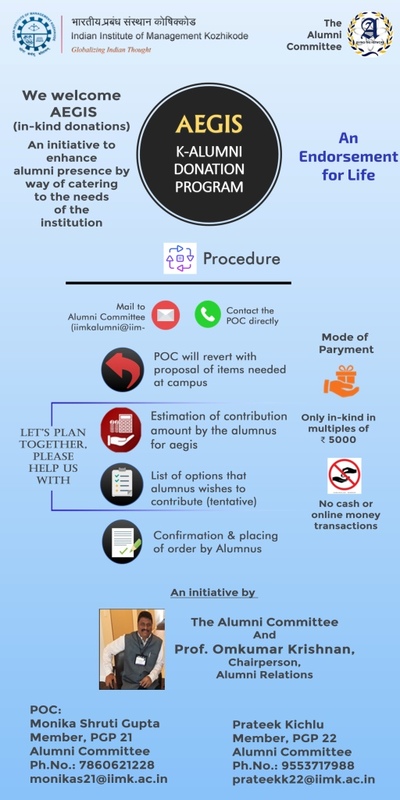 You are requested to forward the following documents in soft copy by email to the Alumni Affairs Office (alumnioffice@iimk.ac.in) on or before 08 September 2016 (Thursday) positively. 2. A write up on why this business, what is so special/unique about the business, why should the founder(s) be nominated, etc. (500 words maximum). 3. Documentary support about the company in the form of registration, news about the company in the media, opinion or testimonial from customers etc. Kindly mention your name and batch in all the above documents. As per the norms, the Institute will nominate only one Alumnus for the award. Please contact the Alumni Affairs Office (0495 – 2809457 or alumnioffice@iimk.ac.in) for any queries and clarifications. On behalf of the Director in-charge, I take immense pleasure in inviting you to the 21st Foundation Day Celebrations and Dinner to be held on Sunday, 21st August 2016. Prof. Pankaj Chandra, Chairman, Board of Management, Ahmadabad University, and ex-Director of IIM Bangalore (https://www.ahduni.edu.in/pankaj-chandra) has kindly consented to be the Chief Guest. I request all of you to kindly participate in the celebrations and dinner, and make this occasion truly joyous and memorable. Venue for dinner shall be announced separately. 21.08.2016 from 4.30 - 7.15 p.m.
Shiladitya Sengupta an alumnus of PGP 15 was all geared up to kick back from his hectic schedule as a Lead Business Analyst at Fidelity Investments for an exhilarating and pragmatic deliberation with his descendants at IIMK. The video conference was much more than dissemination of knowledge and experience, where the lecture hall elevated to be a platform of nostalgic reverberations and blossom of innovative ideas and futuristic technology. In his half an hour long interaction with the students (PGP 19) on 16 June, he articulated about the agile software development practices that are followed in their organization, especially with respect to the product he owns. He elucidated on the five weeks long sprints where they go for four weeks of development work followed by a week of UAT (User Acceptance Testing). He delineated their daily stand-up meetings and how they maintain their backlogs and also informed the students about the software their team uses to assist them to follow agile workflow, one of the most important being JIRA software. JIRA is a proprietary issue tracking product which has been developed by Atlassian and provides bug tracking, issue tracking and project management functions. The cynosure of the discussion with Mr. Shiladitya was his deliberations on his experience about how he, who was not from a computer science background, had mastered a lot about product development during his three years at Fidelity Investments. The interaction was quite inspiring and informative and the question – answer module at the end of the session, provided the students with an opportunity to clarify their queries and apprehensions. He felt glad that IIMK provides the students with an opportunity to interact with alumni because such interactions done with the perspective to obtain industry exposure forms an integral aspect of pursuing MBA. Mr. Shiladitya who holds a bachelors degree in engineering (Electronics and Communication) and a masters in management has demonstrated throughout his career a passion to learn, innovate and bring out exemplary impact in the Asset Management space, both in technology as well as fund management. His academic career at IIMK was attributed not only to classroom learning but also to co-curricular activities which involved his enthusiastic and diligent participation in Culcom – the Cultural Committee, Atharva - the Quizzing Club and ProLitCult - The Literary Club. Allow me to take the prerogative and privilege to announce the maiden EPGP Alumni Committee Elections 2016. To commence with the procedures of electing the office bearers, I deem to invite nomination from those interested in contesting in the election. The Committee comprises five members, from EPGP 01 – EPGP 06 batches. The tenure would for two years and elections would be conducted once in two years. The elected representatives shoulder the onus of travelling to IIM K to engage in face to face deliberations with the Chairperson Alumni Relations and communicate their plans for that year. The Committee would be presided over by the Secretary – Alumni Committee who is ordained to involve in direct conversation with the Chair Alumni Relations. •	Nominations could be darted to alumnioffice@iimk.ac.in. •	Nomination for candidature to contest the election closes at 5.00 pm on 29 June 2016. •	Good luck and I look forward to a candid, equitable and impeccable election. 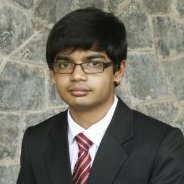 IIMK alum Krishnakumar V.P. (EPGP 06) maneuvers the corridors of popularity with his bodacious and innovative contributions to farming and farmers. His accomplishments flaunt a unique blend of his agricultural ancestry and technical expertise. 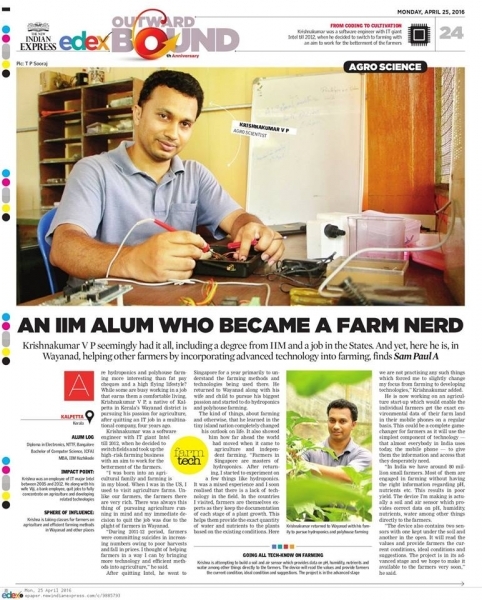 It was nothing but intense fervor for farming that geared him to relinquish the cozy life and exorbitant remuneration of an IT professional and fathom the realms of farming by incorporating advanced technology. Krishnakumar who is the Founder and Chief Analyst of Brown Logic Technologies has an Executive MBA in Business Administration and Management, graduation in Computer Science and Advanced Diploma in Electronics. This is a tremendous achievement and I am sure that you will share with us our elation. The strength of an educational institution ultimately lies with its students and alumni. While the faculty and staff of IIM Kozhikode have no doubt played their part, I wanted to say that the position of your institution would not have been possible without having you with us in this journey. As the institute goes from strength to strength, I am sure that we can count on your continued support in the days ahead. 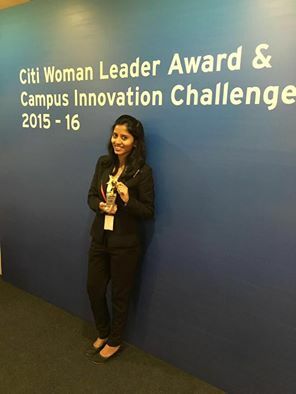 Meghana Prashanth (PGP 19) who represented IIMK has bagged the prestigious Citibank Women Leader Award 2015- 2016. This unique initiative, now in its sixth year, aims to identify young talents and promote future women leaders. The selection was from those who demonstrated exemplary and unsurpassed leadership skills in their first year at college, along with maintaining an exquisite balance between academic accomplishments and extra-curricular activities. In addition to being reimbursed with a fixed amount of tuition fees, the winners were bestowed with a congratulatory certificate and a trophy at a splendid ceremony held in Mumbai on March 03, 2016. How to receive your Transcripts? 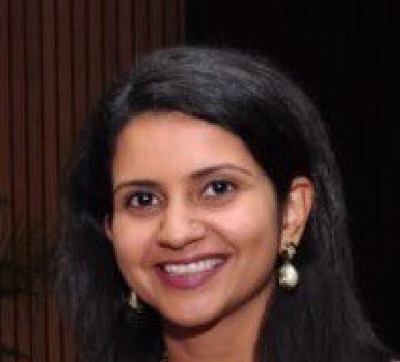 Myntra hires Ananya Tripathi, PGP batch of 2008, to head strategy from McKinsey. Fashion focused e tailer Myntra has roped in Ananya Tripathi, alumni of IIM-K, to head strategy and planning from consultancy major McKinsey, adding to the list of exodus of talent to the start up ecosystem in the country. 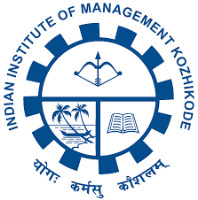 The Indian Institute of Management Kozhikode (IIM-K) will hold its annual management festival--Backwaters 2015 on the institute campus from October 30 to November 1. More glowing coverage of IIM Kozhikode's summer placements - this time with a gorgeous photo of campus.Please do share on your walls with your networks!